This week has restored my faith in the kindness of strangers. The past week has also been rife with world conflict and the disaster in Japan. I pray for those in Japan and for my country. But also in my prayers this week was a little Louisiana Catahoula Leopard Dog puppy named “Christal”. I am a farmer and a breeder of mules, not a pet rescue organization. My farm manager, Susan Powell, has a wonderful Catahoula dog named Breezy. Since the breed is rare, and Susan had a waiting list of forever homes for potential puppies (it is harder for a person to obtain a puppy from Susan than it is to adopt a human child) Susan decided to breed Breezy before spaying her. 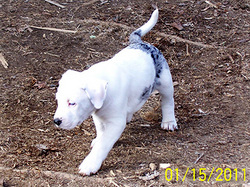 Susan and I whelped the puppies together and when little Christal was born, she had so much more white than blue merle in her coat color that we were concerned about whether she would be deaf or not and knew that she would have to be monitored closely. She is deaf. Susan had many homes from out-of-state wanting to purchase Christal, but since we were not in a position to conduct a home visit, we discussed other options for getting the perfect “forever home” for Christal, which led us to the Louisiana School for the Deaf (LSD) in Baton Rouge, LA. I wrote to the Director, Dr. Monita Hara and told her about our idea of donating Christal to their residential campus where they educate students varying in ages from 3 to 21 years old. Dr. Hara responded almost immediately and told us not to send the puppy anywhere else, and that she would let us know ASAP if the school could adopt Christal. Within hours Dr. Hara let us know that they had been approved to adopt Christal and that the next issue would be transport from our town of Martin, TN to Baton Rouge. I then contacted the good folks at Operation Roger, an all volunteer group of over the road truckers that assist in getting rescue pets to their new families. They agreed to assist us. Then we thought that it would be a grand idea to involve all the media so we could to get this good news story out about how many people were donating their time, expertise and money to get this little, deaf puppy to the deaf students at LSD – the students are going to have a contest to rename Christal something more appropriate to her Cajun roots, since the Catahoula is the “official state dog of Louisiana”! Calls to media outlets ensued. Dr. Hara and I finally spoke on the phone since Operation Roger needed veterinarian information for Christal’s future vet on their application. Dr. Hara informed me that the LSD campus adjoined the campus of the LSU School of Veterinary Medicine and that Christal’s future vet would probably be located there. With this news regarding the LSU campus and the fact that I work with interns and students on our farm from the University of TN @ Martin, I decided to contact the Vet School to see if I could locate a grad student or intern from the School who might be willing to work with Christal, Dr. Hara and the students to further the puppy’s training. I called the Vet School. I told the student receptionist a condensed version of Christal’s story and that I would like to speak with someone about training the puppy. I was put on hold for the longest time. The LSU student came back on the line, and without letting me get a word in edgewise advised me that she was going to connect me to “their hearing specialist”, Dr. George Strain. I assumed that Dr. Strain was a DVM and when he answered I started telling him, rather enthusiastically I must admit, about this miracle in the making (at least that is the way I looked at it!). Dr. Strain interrupted me midstream and basically proceeded to berate me for “this terrible idea”, that deaf dogs are aggressive (good thing he never met my two deaf pet therapy dogs), the students “would not hear the puppy” (? ), deaf dogs get out and get hit by cars because they cannot hear (well so do hearing dogs and people for that matter), that he had conducted 25 years of research on the cause of deafness in animals, he has a forthcoming book being published on the subject (kudos), and all deaf dogs should be euthanized. At some point in this tirade, he implied that deaf people should not own dogs either. I was speechless, which for me is a very unusual thing. After I composed myself, since my head had exploded, I congratulated Dr. Strain on being published, thanked him for his expertise and opinion and informed him that I would be speaking to Dr. Hara about his concerns. I immediately started contacting all my comrades in rescue and every deaf dog advocate group I could find. I wrote e-mails and made phone calls all over the country to try and get the best advice possible. The response was overwhelming and heartwarming and I salute all of those who immediately responded with the question, “What can we do to help?” After getting my ducks in a row, I sat down and wrote an e-mail to Dr. Hara explaining what Dr. Strain had told me and that I did not want Christal, the students or Dr. Hara herself (Christal’s new human family member), to be unhappy or disappointed and to let me know what she thought about the situation and about what Dr. Strain had said. I was on pins and needles waiting for a response from her. I should not have worried. Dr. Hara wrote me back with one sentence, “You spoke to the wrong person”, and attached was the correspondence between Dr. Hara and the Public Relations Coordinator for the LSU Vet School whose e-mail started with “I love this idea….” and ended with “Thank you for thinking about us”. Dr. Hara then sent me another e-mail advising me that the Director of Special Schools for the State of Louisiana, her boss, was thrilled with the idea of Christal joining the LSD family as was the Secretary of Education for the state. Dr. Hara further stated that “the Dr. needs to get off of his high horse….” Bravo, Dr. Hara! It turns out that Dr. Strain is a PhD and a professor of neuroscience, not a DVM. His research on the genetics behind deafness is extensive and his book is being published by CABI Publishing in the UK. I respect Dr. Strains’ research but not his opinion regarding the euthanasia of deaf dogs. That, I do believe is up to the owner. I can guarantee you that I will not be purchasing Dr. Strain’s book. First of all, it is too dry a subject for me and I probably would not understand all that scientific data anyway. Secondly, the cost of the book is $175.00. I would much rather donate that money to a deaf dog rescue or educational organization. Thirdly, I am rather put off by the title of Dr. Strain’s book: Deafness in Dogs and Cats; Information on Deafness Prevalence, Causes, & Management for Owners, Breeders and Researchers”. If his views on euthanizing all deaf dogs and cats were widely accepted, then there would not be any “owners” to purchase his book as all the animals would be dead. So, I find the title misleading and I would encourage those of you who own deaf dogs or know someone who does, and may have been considering purchasing this book as a guide, not to waste your money. While we have won this battle of ignorance with Christal, I have to wonder who may be winning the war. But this experience has touched my heart and every single one of you should be proud! God bless you all.